Thanks a million, John. Way to play a positive role in shaping the 2019 field for governor. Senator John Kennedy (R-LA) announced Monday that he will not run for Louisiana governor. The announcement came following a previous one last week in which Kennedy said he might run for governor during a FOX News interview. We’re fine with the idea that someone who’s in the U.S. Senate wouldn’t be running for governor of Louisiana. This happens nowhere else in America – NOWHERE ELSE. And yet we were about to have it happen in two gubernatorial cycles in a row – first with David Vitter and now, presumably, until today’s announcement – with Kennedy. That wouldn’t have been a good trend and we’re happy to see it nipped in the bud. 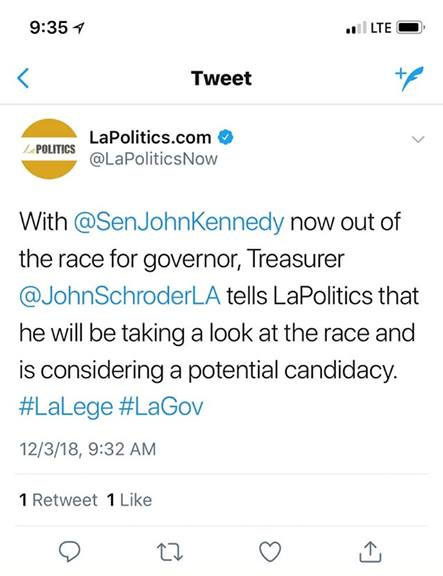 Except what’s happened over the past six months with Kennedy flirting with running is that none of the other prospective candidates have been able to get anything going in terms of name recognition, fundraising, building a campaign team, lining up support around the state or doing any of the other things which need to be done to stand up a campaign for governor. And now it’s getting late in the game – it’s December, and within a couple of weeks nobody will be able to do anything because of the holidays – and what you’re going to see is a mad scramble of underfunded and undernoticed Republican candidates jumping in and attempting to rally support. And the effect is going to be crabs in a bucket. They’ll spend all of their time trashing each other and none of it trashing John Bel Edwards, who is the actual opponent. For years we’ve talked about the necessity of the Republican Party in Louisiana galvanizing around ONE candidate this time, and not repeating the abject stupidity of the 2015 campaign. Kennedy for six months worked to set himself up as that one candidate, and now all he’s done is to create a vacuum a good half-dozen people will rush to fill. It’s a mess. It’s a complete mess, and it was avoidable. If Kennedy wasn’t going to run he should have shut up about running, and that way he wouldn’t be responsible for it. But he’s responsible now, and we’re going to have a hell of a time sorting it out next year. 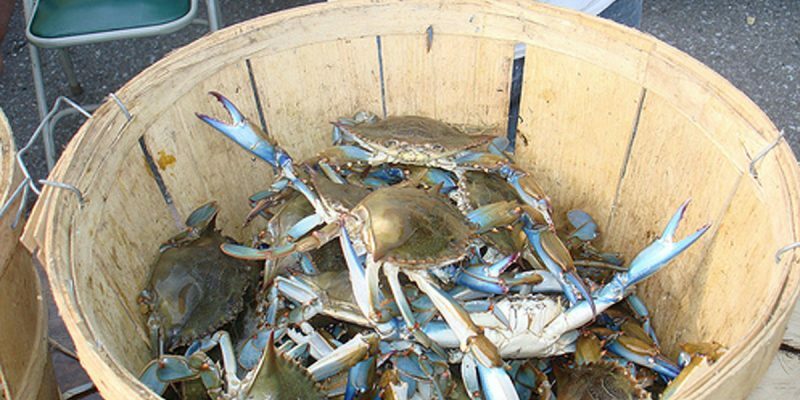 Who are the crabs in the bucket? Well, Eddie Rispone is already in, and what he lacks in name recognition he makes up for in money. Rispone is banking on being Louisiana’s version of Bill Lee, the Nashville businessman who took the Tennessee governor’s race by storm this year and won a huge victory. Rispone actually hired Blake Harris, the political consultant who steered Lee’s campaign into port, to do the same here in Louisiana – except Harris opted for a job as Lee’s chief of staff, so there’s a vacuum in Rispone’s campaign just as there is in the gubernatorial field as a whole. Rispone would probably hire Baton Rouge consultant Lionel Rainey to handle his campaign, as he’s worked with Rainey before. But Rainey worked with Ralph Abraham on his congressional re-election race this year, and we understand he’s pledged to work with Abraham should the latter run for governor – and with Kennedy out Abraham is almost assuredly in, with an announcement coming in imminent fashion. Abraham is a popular congressman, but he’s from Louisiana’s rural 5th District and has little name ID in the major markets in the southern part of the state – and a smattering of TV ads in Baton Rouge and New Orleans he ran this fall as a benefit of having St. Francisville and Bogalusa in his district won’t really have changed that. Abraham is going to need to up his oratory game in a major way, as Rispone does. There’s Sharon Hewitt, the state senator from Slidell, who’s been rumored as a potential candidate. Hewitt has lots of fans, particularly in the New Orleans area, and she’s made a name for herself as an anti-tax champion in the legislature. But she doesn’t have any name ID with the general population either, and unlike Rispone, who can self-finance or Abraham, who can tap into some national money in DC, Hewitt is starting from scratch. She’s going to have a pretty good start on a campaign team if she runs, with Mandeville-based consultants Gordon Reese and Jay Connaughton having run her previous campaigns; they’re very capable. But it’s unquestionably an uphill fight from first-term state senator to governor. Public Service Commissioner Craig Greene has made no secret of his desire to run, though 2019 would probably be a bit early in his timetable. Greene, a surgeon, has the looks and demeanor of a statewide elected official and he’s got bloodlines – his father was long-time state senator Tom Greene. Whether he has the political chops to make this race quite yet is a question; Rainey ran his PSC campaign, and he wouldn’t be on board with this one, so perhaps if Greene ran he’d turn to his longtime associate and former Jindal political guru Timmy Teepell. Or not. State senator Gerald Long is term-limited and has nothing to do next fall, so Long might run for governor. Long had made lots of noises about running in 2015 but opted not to when Vitter entered the race. Nothing stands in his way at this point, and Long is a big fan of his family name and how much of an impact it’s made on the state. We wouldn’t be shocked to see campaign signs reading “Long: Republican” all over the highways and byways of the state soon. Should Baton Rouge congressman Garret Graves change his tune and jump into the race it might present the best opportunity to clear the field and unite the party behind one candidate. Graves is one of the state’s most skilled politicians, perhaps the best outside of Kennedy. And in four years he’s accomplished more in the way of deliverables – Corps of Engineers reform, flood recovery, infrastructure projects like the Washington Street exit in Baton Rouge and the Comite River Diversion Canal, among other things – than any congressional newbie we’ve seen. Graves could build a campaign based on that record and it could be quite effective. The fact he’s already established himself as a critic of Edwards’ leadership in the Governor’s Mansion would also give him credibility. But nothing we’ve seen from Graves indicates he’s even considering a gubernatorial run. Others, like LABI president Stephen Waguespack and Attorney General Jeff Landry, have publicly opted out of the race. Perhaps they can retract those statements and jump in, but in both cases they and their camps are dog-cussing Kennedy – they made their statements in hopes of promoting unity within the state GOP ranks, and in Waguespack’s case his request for a substantive campaign was trashed as a personal shot at Kennedy for two whole days on Moon Griffon’s radio show. And now Kennedy isn’t even in the race. As we said, it’s a mess. And what looked like the possibility of a unified party for the 2019 election is now a shambles. Edwards’ camp couldn’t be having a better day.